Gin Rummy is very similar in aim to regular Rummy, but Gin has some additional wrinkles that make it a more interesting and challenging game. Two players: Gin Rummy is for two players only, so if more than two people want to play, you may want to send the extra people out for ice cream or a walk. In Gin Rummy, each player gets ten cards. The dealer makes the rest of the cards a stock pile by placing them in the center of the table and turning over the first card. The upcard is offered to the nondealer first. If he doesn’t want the upcard, the dealer may take it, and then play continues like in ordinary Rummy except for how the players go out. The first upcard is a free card; be prepared to take it even if it’s only partly relevant to your hand, because the option reverts to your opponent if you don’t take advantage of it. If nothing else, taking the card may mislead your opponent about the cards in your hand. The most difficult (and therefore rewarding) way to go out is to put all your cards into combinations, which is called going Gin. If you go Gin, you score 25 points, plus the sum of whatever your opponent has failed to make into complete combinations — her unconnected cards, or deadwood. You must pick up a card, either from the stock or the discard pile, even if you’re going Gin. To help you understand how to score points after you win at Gin, take a look at the cards in Figure 1. Figure 1: The winner collects points from the deadwood in the loser’s hand. When you go out, your opponent has 18 points left: two 4s and two 5s add up to 18 points; no calculators allowed! Together with the 25 points you get for going Gin, you score 43 points. You can play to 100 or 250 points, depending on how long you want the contest to last. The most intriguing addition to the rules of Gin Rummy, compared to the standard Rummy rules, is that you have more than one way to go out at Gin. Instead of putting all your cards into combinations, you have the option of knocking (which involves literally tapping the table) if you have put almost all your cards into combinations, and the cards that don’t make combinations total less than 10 points. If you get to this point, you can knock (just once will do — no matter how happy it makes you feel) and then put your cards down on the table. After you knock, play stops, and the tallying begins. Your score comes from the deadwood — cards that aren’t part of combinations. If your opponent’s deadwood exceeds your deadwood, you pick up the difference between your total and his. If your opponent’s deadwood doesn’t exceed yours, read on to discover the consequences. Take a look at the cards in Figure 2 to get an idea of how to score after you go out by knocking. Figure 2: Someone’s knocking at the door; someone’s racking up some points. Sometimes your opponent can outdo you when you knock, because he has an additional way to get rid of his deadwood. He can put down his combinations, of course, and those cards don’t count toward the score. In addition, he can add his loose cards to your combinations. After your opponent adds any loose cards that he can to your combinations, only his remaining cards count. Glance at the cards in Figure 3 for another example of how scoring can work after someone knocks. Your opponent knocks with 6 points, and you appear to have 11. But your Jack of Diamonds can be added to her run, reducing your total to 1 and enabling you to undercut her by 5. You score 25 points plus the difference (5), so you get 30 points. 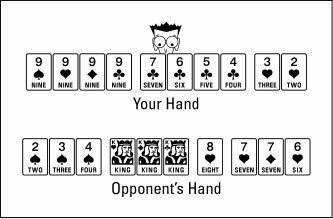 Figure 3: Sometimes you can add cards to combinations after your opponent knocks. In Oklahoma Gin, which is the most common form of competitive Gin Rummy, the number of the upcard may further restrict your ability to knock. You can knock only if your total of deadwood is less than or equal to the initial upcard. What’s more, if the upcard is an ace, you can go out only by going Gin. Always knock if you can do so early in the game, unless your hand is highly suitable for going Gin. 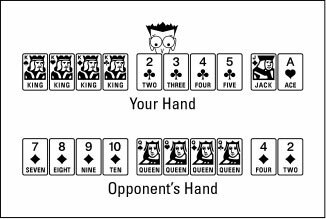 So, for example, if you can knock early in the game with the cards shown in Figure 4, go ahead and knock; only three cards can let you go Gin, and the chances of your getting one of those three cards is below the average expectation. If five or more cards can let you go Gin, play for Gin instead. The longer the game goes on, the more wary you should be of knocking. 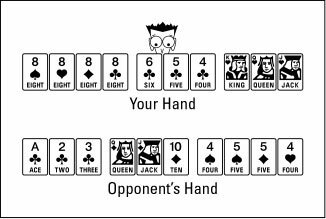 Figure 4: Go ahead and knock with this hand. Win, lose . . . or draw? In Gin Rummy, the hand doesn’t have to be played to a conclusion. If the stock gets down to two cards, the hand ends right there. Just throw in the cards and start all over again.